I could never understand why some people are willing to spend $10 trying to get that tiny soft toy in those UFO catcher machines to bounce down into the prize chute. Even spending $2 for 2 unsuccessful tries within a minute pisses me off to the bone. That's because that $2 could have lasted me at least 10 minutes on any other video machine within the arcade. If you understand how the UFO catchers work, you'll definitely not want to waste your money on these dastardly coin-sucking inventions. Yes, you DO have a chance of using a single dollar to win yourself something that would easily cost you around $9.90 at your local minitoons shop, but don't forget that you have and even HIGHER chance of spending $10 and walking away empty handed. I'll gladly buy it off the shelf anytime thank you. Any machine that you find in the arcade is DESIGNED to be profitable. Do you think they would happily line up so many of these machines if everyone could just catch something worth $10 with just $5? So here's the science of these evil robots that love to feed on the emotional stupidity weakness of the female species. Those 'claws of fate' are programmed to only allow a 'proper win' only once the cost of the toy has been covered and they are already earning some profit. A 'proper win' is one where the claw actually brings the toy all the way to the prize chute and drops it straight down into your awaiting hands. If you are observant enough, you'll notice that although the claw has a gd grip when it goes down to 'grab' the toy, after it raises all the way up, there is always a slight jerk. And believe it or not, the claws are PROGRAMMED to loosen their grip when they reach the top, unless the 'proper win' counter has been hit. This loosening of grip coupled with the slight jerk is a sure-fire way to ensure that the toy will always drop from the claw. If you're lucky enough to be playing just when the counter hits, then all I can say is good on ya mate. But let me tell you, that counter is usually at least double the price of the toy you're getting. The rest of us unlucky people will have just have to depend on more luck to determine if we are going to win a prize. This comes in the form of the direction of the bounce of the toy when it hits the playing platform from the drop. If you're wearing red underwear, are carrying a rabbit's foot keychain and wearing a four-leaf clover necklace, maybe, just maybe, that toy will bounce right into the prize chute. Otherwise, you can go look for that machine attendant to request for the toy to be replaced in its original position as more often than not, it will bounce AWAY from the hole. However, it just so happened that yesterday, Friday the 14th, was a lucky lucky day for us. After loads of pestering, she finally managed to drag me to 'waste money' on one of these machines. 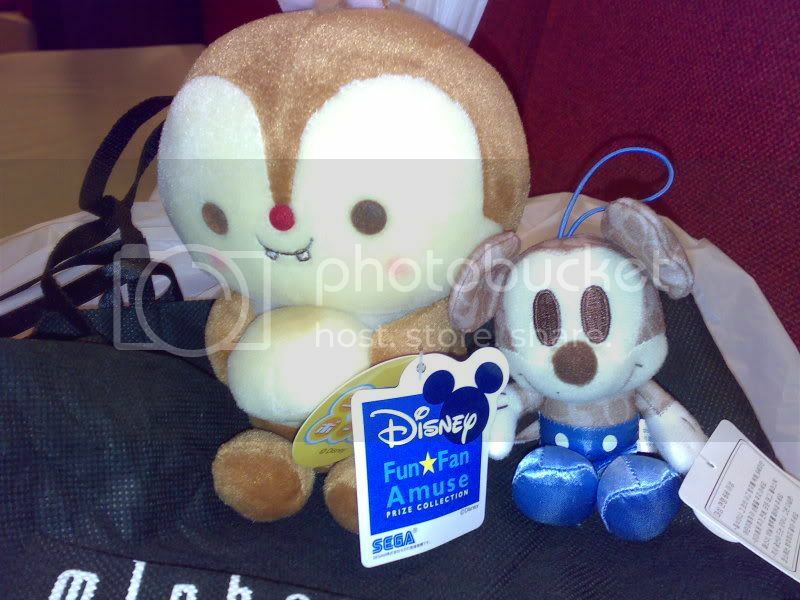 But amazingly, that round faced chip n dale soft toy decided to bounce right into the chute on our first coin! And that's not all. Little did we know that with every win comes a chance to 'roll the dice' and win another toy. It was essentially the same thing, apart from the fact that this time the toy you're catching is a soft toy dice and the claw doesn't lose its grip. So we managed to roll a 'one' and win ourselves another mini mickey mouse toy. All this with just $1! Unfortunately, girls being girls, our $0.50 toys became $2 toys after a total of 3 more unsuccessful attempts. But the best part has yet to come. As you should know, when you catch a toy, you are allowed to exchange it for any other toy within the same machine. After asking me a gazillion times whether the round head mickey or round head chip was cuter, she finally decided to stick with the squirrel. 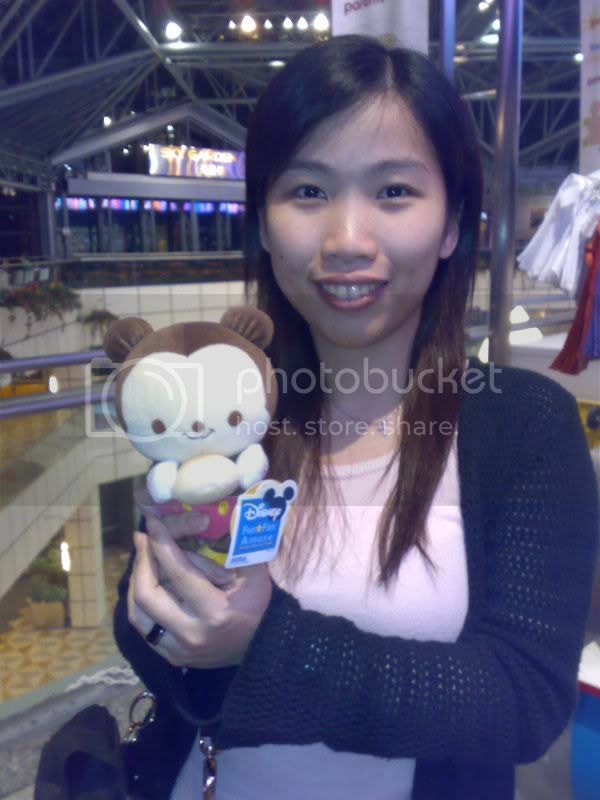 But after a movie, shopping and dinner, she dragged me back to the machine and asked the attendant if she could exchange it for the round head mickey toy. He was a little reluctant at first but finally gave in after a bit of coaxing. See, if girls don't even know what they themselves want, how can they expect us guys to know what they want?? Ive never tried getting a stuffed animal from those claw things. I would probably just look really stupid.